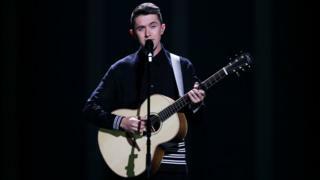 Ireland will take part in the Eurovision Song Contest final for the first time since 2013 after making it through the first semi-final in Lisbon. Israel, Cyprus and Finland - featuring former X Factor semi-finalist Saara Aalto - were among the other nine countries who progressed. But Greece and Belgium, who had been tipped to qualify for Saturday's main event, failed to make it through. A further 18 countries will take part in the second semi-final on Thursday. The UK, represented by SuRie, is automatically in Saturday's final as one of the "Big Five" countries. The other four are Germany, Italy, Spain and France, while hosts Portugal also automatically qualified for the final. Israel's Netta is among the favourites for the main prize after competing in the first semi-final with her track Toy, which has a powerful message of female empowerment - and a quirky chicken dance. Cyprus, another country widely-tipped to win the grand final, was represented by pop star Eleni Foureira, who brought the tropical and catchy beats of her track Fuego. Born in Albania, Eleni first established herself as one third of Greek group Mystique in 2007. The Czech Republic's Mikolas Josef has been touted as the nation's answer to Justin Bieber. The 22-year-old's rendition of Lie To Me - a bouncy, swaggering tale of young love - has clear mainstream appeal. He had to go to hospital after sustaining a neck injury during rehearsals. Other notable acts included Finland's Saara Aalto, who won over UK audiences during her time on The X Factor in 2016, despite losing out in that contest to Matt Terry. Ryan O'Shaughnessy represented Ireland, which has more Eurovision wins - seven - than any other country, but has not won the competition since 1996. His song Together is about the end of a love affair and features two males dancers as the splitting couple. Some viewers may remember him for reaching the Britain's Got Talent final in 2012. The nine unsuccessful countries included Azerbaijan, which had previously never failed to qualify from a Eurovision Song Contest semi-final since first entering a decade ago. The other stories to fall at the semi-final stage were Armenia, Belarus, Croatia, FYR Macedonia, Iceland and Switzerland. The UK's hopes in the grand final at Lisbon's Altice Arena on Saturday night will rest on London-born singer SuRie, who will perform her ballad Storm. Speaking at the first semi-final, the singer, whose real name is Susanna Marie Cork, said she was excited for Saturday, adding: "It's such a dream."